These Glass Awards feature a mirror accented base and are packaged in satin-lined, padded gift boxes. 3/16" thick glass, suitable for all ocassions. 3/4" thick acrylic Arch award. Jade only. These Glass Awards feature 3/8" thick glass and a unique arched gold base. This Glass Award comes in a beige laminated gift box. 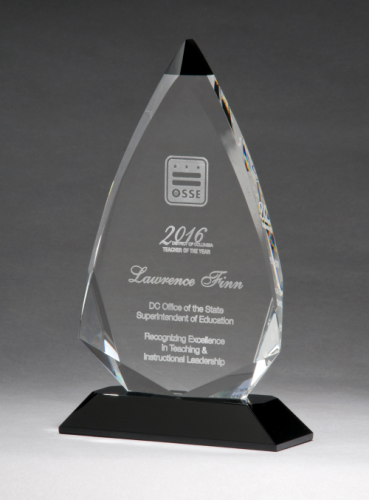 Large and impressive Arrow Series acrylic award is produced from 3/4" thick cast jade acrylic. Arrow shaped Optical Crystal award with black accent on black crystal base,. Packaged in satin-lined, padded gift box. Blue art glass star with gold metallic highlights. These beautiful glass awards are packaged in satin-lined, padded gift boxes. Each piece of art glass is made by hand, air bubbles and color variations are common. Art glass award disk with blue and light green accents on black glass base.These glass awards are packaged in satin-lined, padded gift boxes. Each piece of art glass is made by hand, air bubbles and color variations are common. PRICING INCLUDES ENGRAVING !